Quijano Windsurfing Retreat has a very peaceful ambiance and is located at a sand beach lined with palm trees and beautiful cottages built at the foot of a small hill covered with trees. The wind blows on shore slightly from the left, permitting long rides inside the bay or going over the reef into the waves. Mediocre windsurfers find ideal conditions to practice the water start in chest deep crystal clear water. Quijano Windsurfing Retreat provides storage facilities for windsurfers, regardless whether they rent a cottage with us or stay in a hotel in Cuyo town and visit Quijano beach just during the day. Going from Quijano beach in Magsaysay to Cuyo town is a 20 minutes ride by motorbike through a lush green landscape with lots of smiling people. During periods with low tide during daytime our guests surf at Capusan Beach in Cuyo town where storage facilities are also available. Windsurfer are welcome at our beach regardless whether the stay with us or in Cuyo Town. 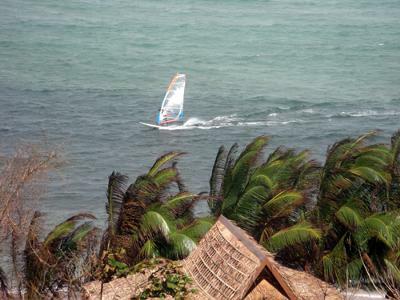 You must bring your own boards & sails as there are no board rental facilities on Cuyo Island. Air Juan flies every Wednesday, Thursday, Saturday and Sunday between Puerto Princesa and Cuyo. Enough space for kite equipment. Air Juan flies between 15 October 2016 and 31 January 2017 every Wednesday and Sunday between Boracay (Caticlan) and Cuyo. Enough space for kite equipment. Anino Retreat is the new name of the former Quijano Windsurfing Retreat. Since 2014 Cuyo can be reached by Air Juan every Monday, Wednesday and Saturday. By ferry to Cuyo Island: Fly to Puerto Princesa or Iloilo and from there by ferry to Cuyo: twice a week from Puerto Princesa to Cuyo / twice a week from Iloilo to Cuyo. Once a week is a ferry between Cuyo and Coron. Coron inquiries +63 915 987 3655.